A lawyer by training, specialized in art business law, I have always been passionate about horology. 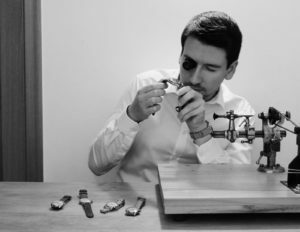 This is why I decided to create this website in order to buy, restore and sell vintage watches. Some of you already know me through forums like forumamontres, chronomania and omegaforums.net where I regularly participate under the nickname « pianiste ». The purpose of this website ? Proposing nice vintage watches selected by myself, always in very good working condition. I indicate for each watch if a service has been done, and I provide one year guarantee. The watches can be seen by appointment but I can also ship worldwide by DHL express. Don’t hesitate to contact me if you need more information.